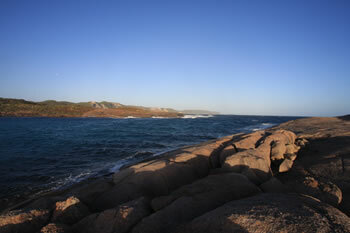 Boat Harbour is located 35km west of Denmark about half way between Parry Beach and Peaceful Bay. Take Boat Harbour Road or Pitt Road off the South Coast highway. The road is NOT sealed and is really a 4WD/AWD only access road. 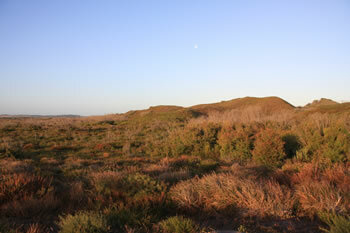 The Bibbulmun Track passes through the forest and dunes past this remote bay. 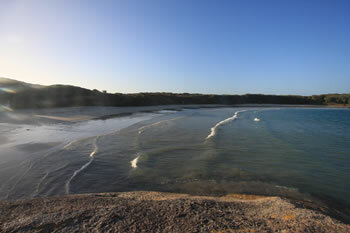 The channel which leads to the beach offers great views of the Southern Ocean. The land alters quite dramatically in this area with heath covered hills and rocky terrain, with only a few tall trees. Boat Harbour is surrounded by the Quarram Nature Reserve which includes Owingup Swamp and is mostly low-lying rolling bushland and wetlands. Picnic Tables are located at the boat launch near the carpark. Swimming is not advised. Note on Accessing Boat Harbour: We made it to Boat Harbour in our Subaru Forester all-wheel-drive, however it was during the wet season and the track was compacted. We do not advise trying to reach Boat Harbour without a 4WD /AWD vehicle. DANGER: Stay clear of costal rocks and the shoreline as this area is prone to extra large waves and surges. There is nothing between this coast and Antarctica. Do not underestimate the power of the ocean. Your safety is your responsibility. Be extremely aware when climbing, driving or walking close to the waterline and pay close attention to the signs. SAFETY: NO SWIMMING. Large waves and rips.